FlashStack is a flexible, all-flash converged infrastructure solution that brings the flash revolution to your data center, faster. It combines the latest in compute, network, storage hardware, and virtualization software into a single, integrated architecture that speeds time to deployment, lowers overall IT costs, and reduces deployment risk. Highly efficient components coupled with simple, intelligent software reduce the costs associated with power, cooling, and data center space. Based on 100 percent primary flash storage, FlashStack provides the performance and reliability that business-critical applications demand. Every day in our work as Solutions Architects, we encounter administrators who are frustrated over seemingly constant challenges that require superhuman efforts to keep production workloads online and available. Issues such as lower than expected legacy storage performance or abysmal backup/disaster recovery RPOs/RTOs can at most be triaged but never be truly resolved. In addition, we have to deal with legacy technology debt, unnecessary complexity and silos throughout the data center. Most IT infrastructure solutions today have a narrow field of vision when it comes to designing for robust long-term data protection, and managing the exponential data growth expected in modern datacenters. This forces customers to deal with these absolutely business critical issues in an ad-hoc manner, most often when they are already actively running production environments. Pure Storage has partnered with Cohesity to deliver a high performance, robust data protection and data management solution for FlashStack that enables organizations to fully leverage the cloud for datasets that ’belong’ to the cloud, i.e., archives and cold data. All this is managed and orchestrated with a simple single pane of glass. Due to a recent, well-publicized debacle with the “public-cloud” that left businesses reeling from a human error, we have been re-invigorated to educate our customers about the benefits of hybrid-cloud designs. Our goal is to help them build performant, resilient and end-to-end protected infrastructures with the ability to recover nearly instantaneously from failures, while also providing security around data to eliminate the threat of ransomware attacks. As this example showed, the reality is that a massive outage can happen anywhere. The difference between a business staying online versus experiencing an outage, comes down to the robustness of your data protection and disaster recovery plans. Next generation storage and secondary storage from Pure and Cohesity, respectively, have dramatically simplified and altered the management paradigm for administrators. This shift up the stack goes away from struggling with minutiae and instead focuses on relevant technologies like orchestration and protection that make the business more agile and secure. Our new joint solution describes in detail how to integrate with Cohesity to protect VMware Horizon. We selected VDI as our primary example workload as it demands sub-millisecond storage performance provided by Pure, includes several common workloads found in the datacenter (e.g. Microsoft SQL, VSI, virtual desktops) and expects full-scale data protection and recoverability from something as small as individual user files to potentially the entire environment. 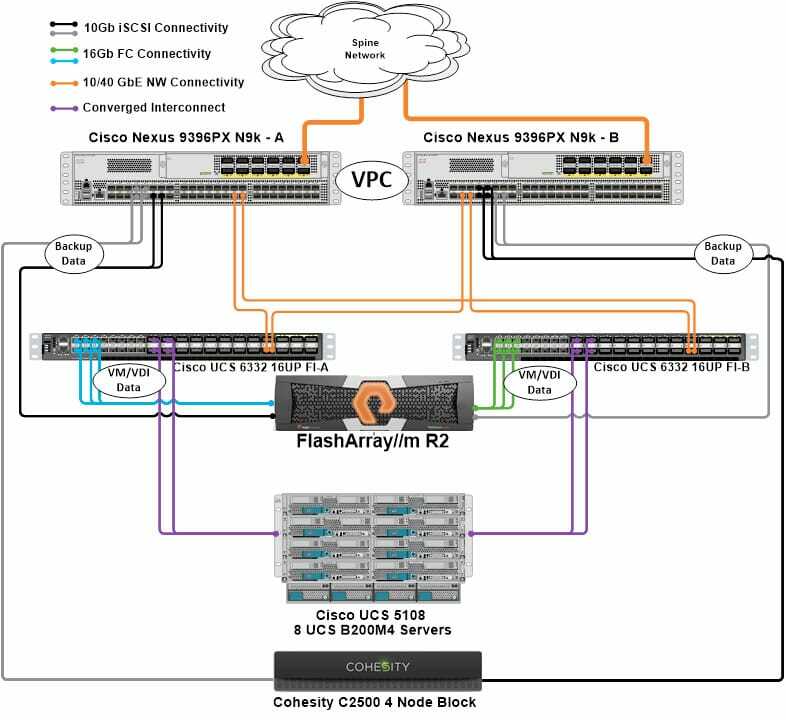 The below topology diagram shows an overview of the Cohesity integration with FlashStack. 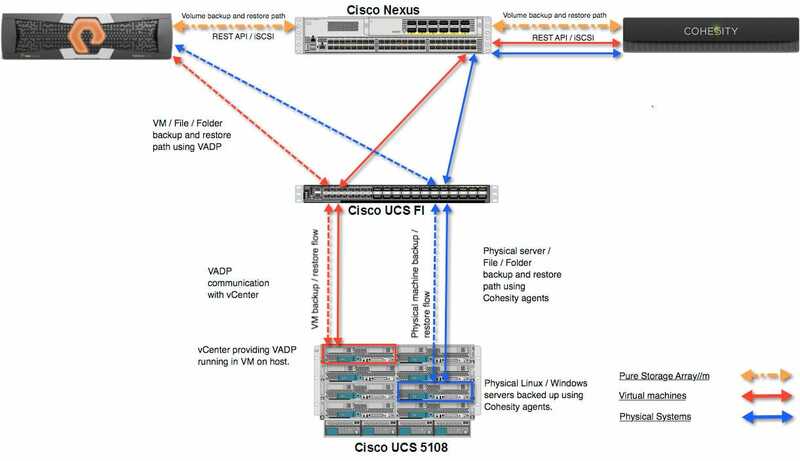 In the diagram, we can see that production network traffic is cleanly segregated from backup traffic at both the component as well as protocol level, maximizing resiliency and performance. The next diagram goes into more detail of the connectivity at play within the design. Cohesity has integration with Pure Storage volumes via our REST API, vCenter with VADP and has agents for physical Windows and Linux host integration. We will showcase and certify that Cohesity and FlashStack deliver an optimal blend of performance, user-friendliness, non-disruptive operations, and data recoverability from the micro to the macro for multiple workloads. 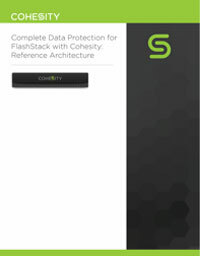 We will describe a FlashStack solution with Cohesity integration that illustrates how these solutions fit together to provide an optimal data management solution for a VMware® Horizon solution that includes the ability to rapidly recover the entire environment – all the way down to individual user files and everything in between. 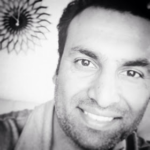 Finally, we will showcase how this unique Flashstack with Cohesity integration solution brings the best of both primary and secondary storage, hence delivering value to applications in tier 0 through tier 4 workloads. Our goal with this data management solution is simple: Provide a best of breed solution that emphasizes ease of use, resiliency, performance and data protection. By focusing on these four pillars, it frees our joint customers from being weighed down tuning and turning knobs and in its place allows them to focus instead on current industry trends and technologies to better the overall business. Our solution guide below dives into substantially more detail of the use cases discussed as well as some that were not like physical server protection and recovery. To read more, please click on the below link.